As you learned in Podcast #390, fresh off the presses this week, I’m a fan of nicotine as a relatively safe nootropic. Nicotine has been studied and shown to play a beneficial role for conditions such as ADHD, anxiety disorders, depression, Alzheimer’s, Parkinson’s, dementia, and even cognitive performance in the general population. It’s also a cheap and easy cognitive performance enhancement aid. When it comes to a decent gum option, I’ve reviewed the ingredients label of all the brands out there, and Habitrol seems like the “lesser of the evils” when it comes to somewhat low amounts of artificial sweeteners and chemicals. It’s not perfect (someone needs to invent a stevia-flavored nicotine gum – just sayin’) but is a pretty decent option. I chomp on 1-2 pieces of the 2mg version per day. You can get it here on Amazon. Kitchari – As I recently posted to Instagram, I’m doing a bit of a liver cleanse this week, and having kitchari for lunch and dinner. In India, Kitchari means “mixture”, and is a pot meal primarily composed of lentils or mung beans and rice, traditionally made with a little ghee (clarified butter) or coconut oil and a variety of spices. It is simple, easy to digest, and because it combines legumes with grains, a complete source of protein. It is often taken as a fast, in which a person will consume only kitchari for a number of days, to aid in the clearance of toxins and strengthen their digestive fire – and is also given therapeutically as part of “panchakarma” – Ayurveda’s ancient mind-body, cleansing and rejuvenation practice to strengthen the digestive and immune systems, a practice I discuss in this podcast episode with Dr. Stephen Cabral. 2 cups of any mixed vegetables I used bok choy, cilantro and dinosaur kale. -The night before (24 hours earlier), soak mung beans in ample filtered water. -When you’re ready to cook, drain the mung beans and rinse under running water. Place rice in a sieve and rinse till the water runs clear. Prepare vegetables by peeling and chopping them up, then set all of this aside. -Heat coconut oil over medium heat, in a heavy-bottomed pot. Add cumin, fennel, fenugreek and black mustard seeds and cook for a few minutes to release aromatics, and until the mustard seeds have popped. Add the rest of the spices and stir to combine. -Add a cup of vegetable stock, followed by mung beans, kombu, coconut cream, rice and vegetables, then add the rest of the stock (or water). -Cover and bring to a boil, then reduce to a low heat. Simmer for about 40 minutes. Check the pot periodically as the rice swells and may stick to the bottom. Add more water if you want a soupier consistency, and simmer longer to get a thicker stew. -Serve with fresh coriander chopped and folded through, a drizzle of fresh lime juice, spoonful of coconut yogurt and sea salt to taste. HUMU Augmented Audio Cushion: The Flexound HUMU is a speaker innovation – a “feel sound” speaker – that lets you feel the sound via vibration. Yep – it is sound vibration furniture and transforms sound to your sense of touch while providing you with a 3D audio experience that transmits through your body. HUMU takes your listening experience to a completely new level. Via an “Audio Cushion,” the sky is the limit in terms of ways to use it– lay back and watch a documentary, relax before going to sleep while listening to binaural beats, meditate with peaceful sounds that vibrate your whole body and much, much more! My kids dig it too and you can grab one here. Use the above links in the next 72 hours to save an additional 10%. – A Deep Dive Into How To Interpret The Results Of Your Blood Testing – Ben Greenfield Reveals & Walks You Through His Laboratory Results From WellnessFX. – 390: Is Nicotine Healthy, How Long Does Stem Cell Therapy Last, A New Way To Fast & Much More! – Why I Eat Tapeworms & Whipworms Every Two Weeks: The Fascinating World Of Helminthic Therapy. – Mind Pump Media Podcast – 867: Ben Greenfield on Anti-Aging, Minimizing Jet Lag, Starting a Supplement Company & MUCH MORE! Increase your cellular energy. Fuel your mitochondria. Help regulate your circadian rhythm. Support muscle recovery. That’s what NAD does on a biological level, and you can increase your NAD levels (based on clinical studies) with nicotinamide riboside (NR), the key ingredient in Tru Niagen. ***TO WIN*** a 6 month supply of Tru Niagen, comment on of the following Tweet or Facebook or Instagram posts and tell me how your life would change if you had more energy. You can also learn how you can make more NAD with Tru Niagen here. This contest is only open to individuals 18+ and prizes will only be shipped within the US. The 2018 SPARK Bio-Hack Conference is rapidly approaching. features a series of talks by leaders across a range of fields with an eye on optimizing human performance, recovery, and longevity. Researchers, medical specialists and other biohacking experts will share provocative, informative, and inspiring presentations meant to amplify your life. Registration is now open, secure your spot here. Join me on November 13 in Chef David Bouley’s Test Kitchen in New York City for “The Ultimate Anti-Aging Diet – The Perfect Foods To Eat Your Way To Longevity”. Get your ticket here! – October 19-20: Elite Chiropractic Annual Seminar, Chicago, IL. Would you like to experience the rush of an empowered mindset and systems that will create rapid growth? If your practice has plateaued or is stuck, Elite Coaching will rocket you and your team to the next level. Learn the most advanced, effective, researched communication and self-empowering systems in the profession that will inspire the best in you, your team and your patients, right now. It has been proven, in well over 200 offices, to yield consistent and predictable results. Register here! – October 20, 2018: Toyota Park Stadium Sprint, Bridgeview, IL. For the first time, Spartans will run through the home of the Chicago Fire Soccer Club, a Major League Soccer team and the Chicago Red Stars, a National Women’s Soccer League team. Register here! – November 2 – 4, 2018: Live It To Lead It Health Centers of the Future Seminar, Las Vegas, Nevada. Create the life you want, the marriage you want, the family you want—all fueled by a practice that radically changes the lives of your patients. this three-day event, you’ll learn the latest medical discoveries in cellular health, get a marketing plan for scaling your practice and find ways to build residual passive income. Join me! – November 10 – 11, 2018: Fenway Park Stadium Sprint, Boston, MA. Spartans are invited to participate in the Fenway Sprint over two days, November 10th and 11th. Gain unprecedented access to previously closed off areas of America’s Most Beloved Ballpark. Join me! – November 13, 2018: The Chef and The Doctor Series, New York City, NY. Join me in Chef Bouley’s Test Kitchen for “The Ultimate Anti-Aging Diet – The Perfect Foods To Eat Your Way To Longevity”. Get your ticket here! – December 1, 2018: AT&T Park Stadium Sprint, San Francisco, CA. Can you feel the energy, San Fran? Run around the concourse. Rope climb in the outfield. Do burpees in the dugout. Challenge yourself to three miles that will include 20+ signature obstacles. Join me and register here. – December 13-15, 2018: World Congress 2018 Hosted by the American Academy of Anti-Aging Medicine, Las Vegas, Nevada. If you attend any conference this year, make it the American Academy of Anti-Aging Medicine’s 26th Annual World Congress. The fact is, in an era of andropause, low drive and deteriorating men’s health, it’s shocking that both practitioners and the public aren’t aware of ancestral wisdom and modern scientific and medical tactics that can be used to optimize male physiology. It’s time that changed, and I’ll be teaching exactly how to make men, men again. Join me! – April 6-7, 2019: FitCon Summit, Salt Lake City, Utah. FitCon® encourages everyone to Find Their Fit. It does not matter whether it is powerlifting, Crossfit, bodybuilding, roller derby, or even axe throwing. Be sure to visit the Kion booth in the expo! This week on Snapchat I told you about my morning detox drink consisting of fresh celery juice, Kion Aminos, Organifi Green Juice along with some malic acid to get things moving. Add me here on Snapchat to follow along! 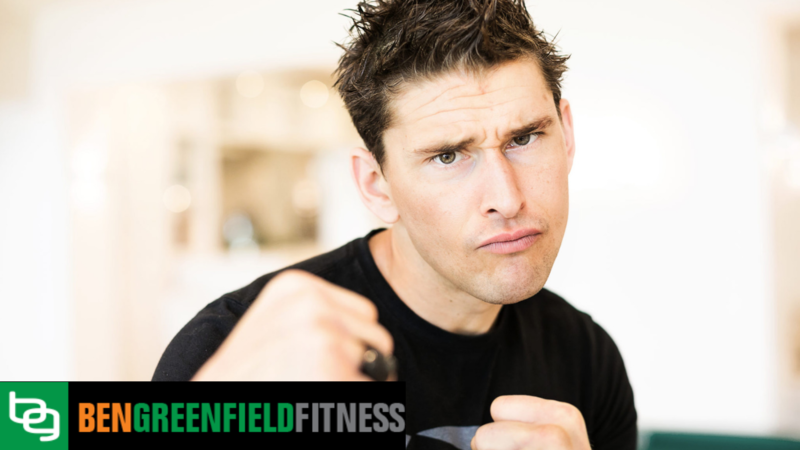 Ben Greenfield Fitness saved to “Fat Loss.” Read the article here. While it does contain ultra-pure fish oils in their natural triglyceride form, it also contains protective Omega-6 GLA from borage seed oil, the powerful antioxidants Vitamin D and Vitamin A, full-spectrum Vitamin E tocopherols and tocotrienols, and the super powerful carotenoid Astaxanthin. SuperEssentials® is the perfect complement to LivingFuel’s functional superfoods and comes in easy-to-swallow buffalo gelatin capsules. Huge Fan. Just wanted to know whether or not you still plan on stopping by in Boston in a couple of weeks to do the Spartan Sprint race at Fenway Park. Unfortunately, I won’t be participating, but I was wondering if there is a way to meet up with you and have a discussion with you after the race? Thanks for everything that you do and research, it is truly inspiring and at times life changing. Apparently, hair loss is a serious side effect of nicotine gum use. I read multiple accounts where Nicorette gum causes hair loss in regular users. Do you think Habitrol causes hair loss too? Or is there some ingredient specifically in Nicorette that causes the hair loss?